This is Red Kote. 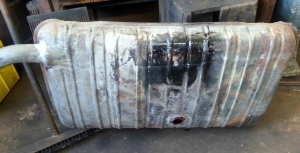 A fuel tank liner. 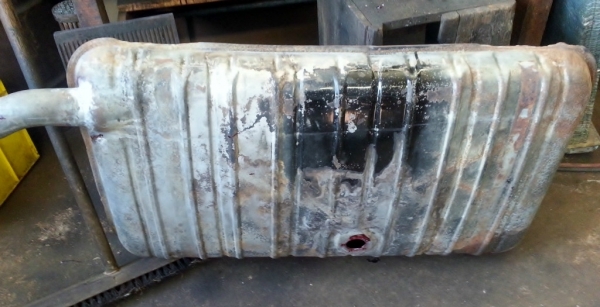 When you bring your fuel tank into Muirs Radiators we will repair it. We chemically clean out the fuel tank for safety to do the repairs. 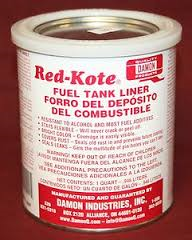 After repair have been made we can then coat the inside of your fuel tank with a fuel tank liner called Red-Kote. Red-Kote is a liner that helps us to ensure the fuel tank is completely sealed. This product is resistant to alcohol and most fuel additives. Stays flexible so that means it will never crack or peel off. It is brightly coloured so we can be sure that the entire inside of your fuel tank is covered. It seals the multitude of pin hole leaks that you cant see. We can also manufacture complete new fuel tanks to fit your vehicle specifications.